You need to know what you are trying to achieve in your business, what skills and knowledge you will need to get you there, and the steps to take to make it happen. When you bake a cake, you have to know what ingredients you’ll need, and follow the recipe to get the correct outcome. Make it up as you go along, and the results could be not so great. If you know me or have followed me for a while, you’ll know I love tea. I also love cake. Tea and cake together is great, and if you book a session with me, it will likely involve these elements. I’m not the baking sort (I just like the eating part), but I often use this cake baking analogy when explaining why you should set out plans for your business, rather than just drifting along and reacting to the things that happen. If you are going to bake a cake, you know what cake you want to end up with. If you don’t work the ingredients and method out in advance, you will take so much longer to get the desired result after several tries, or it will go horribly astray and you will end up abandoning it. What if when you start, you don’t know the method to make the cake you want? You keep trying different things to make it work, making a complete mess of things. You might realise you need a piece of equipment that you don’t have, and didn’t know you needed. If you do already have it, is it up to the job? Do you need to use a particular skill or something you don’t know how to do yet? Can you learn it as you go, or is it something you should have learned before you got stuck in? Can you stop where you are and learn it quickly, or will that ruin the cake if you pause now? The steps must be followed in the correct order to get the desired result. Finally, if you are rubbish at baking, you might actually just buy cakes or get other people to make them. 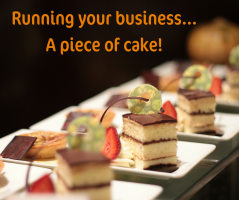 Running and growing your business is much like baking a cake. You need to have that vision of what you are trying to achieve, and work out the resources and steps needed to get you there. Don’t drift along not getting the right things done at the right time, or waste time with trial and error – work out how it can be achieved, and stick to the process to get the cake business you want. This could be your short term goals, or a vision of how you’d like your business to be. Only want to work so many hours or days per week? Don’t want to be the only person working in your business forever? Want to start sending email newsletters before the end of the year? What is the result you are looking for? Like having the image of the finished cake, you could have a vision board of your goals. What actions do you need to take to achieve this? Break it down into smaller steps, working out exactly what needs to be done at each stage. Create your recipe. Put timescales to these actions to keep you on track, and make sure they are carried out in the correct order if necessary to prevent hold-ups further down the line. Make sure you have the correct ingredients. Will you need a particular piece of equipment, or software? Something you’ll need to have signed up for online? Extra staff perhaps? Whatever you need in place, make sure you have it ready so you don’t waste time sorting it out when you get to that step. What skills or knowledge will you need? Unless you already know everything (we all know someone who does…) you will probably need to learn something new in order to improve your business. You can’t make a beautifully decorated cake if you can’t do the icing. The more skills and knowledge you have, the better goals you can achieve in your business. What will you need to learn or refresh yourself on, or get someone to train you in, to complete your action steps? You might need to improve your finance skills to forecast more accurately, or be more comfortable with selling yourself if you need more clients. You may want to learn how to use Mailchimp for sending newsletters, or Canva for creating graphics for social media. Some of these can be done ‘on the job’, learning while you start to do the task. Some training might need to be done before you can move forward with something (perhaps offering a new service that needs a qualification). Know what you need and when you should do it, so you don’t lose momentum sorting it out at an inconvenient time. Stay on track and see it through until you hit your goal. Stick to the process you set out, only tweaking the steps when you really need to. Things do change, and you may well need to improvise sometimes, but try to stick to something tried and tested rather than making up your own way. Though admittedly, this is sometimes how you end up with something amazing – use your own judgement! People have no problem with using a cook book to show them what to do. If you get stuck or need some advice, ask someone who does know what they are doing to share their knowledge and experience. Can you get someone to show you how to do whatever it is you are trying to do? That way you can get it right every time. Could the task at hand be outsourced to someone who already knows how to do it? Then you don’t need to spend time faffing about with it and can move on to something else. Speak to other business owners, you will probably find someone who can share their story of what happened when they did what you are trying to do, and tell you how they made it work.